90 calories per 1/2 cup. US inspected and passed by Department of Agriculture. CampbellsKitchen.com. Steel. Please recycle. Where facilities available. Clip & earn 5 points for your school! Labels for Education. labelsforeducation.com. We begin with good, honest ingredients like farm grown carrots and potatoes. Good source of vitamin A. Good source of fiber. Low in fat & cholesterol. 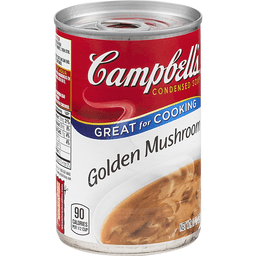 Visit our website at: www.campbellsoup.com. Satisfaction guaranteed. If you have questions or comments, please call 1-800-257-8443. Please have code and date information from container. 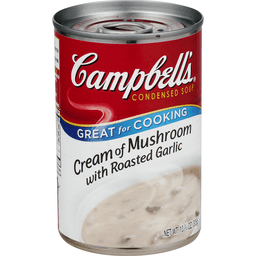 Visit our website at: www.campbellsoup.com. Cooked with care in the USA. Per 1 Cup Serving: 150 calories; 0.5 g sat fat (3% DV); 690 mg sodium (29% DV); 15 g sugars. No colors from artificial sources. No artificial flavors. Questions, comments? Save can and call 1-800-200-9377 weekdays 7:30 A.M. to 5:30 P.M CT. Vegetarian. Partially produced with genetic engineering. Learn more at Ask.GeneralMills.com. how2recycle.info. Box Tops for Education. Visit our website at www.Progresso.com. For over 100 years, our kitchens have crafted honest, soul-satisfying recipes with real ingredients you're proud to serve. 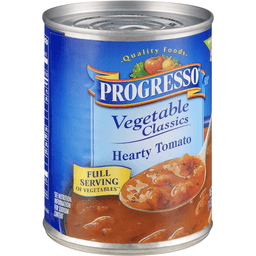 Visit progresso.com for even more coziness. 1/2 cup of vegetables per serving. No MSG added. See nutrition information for sodium content. Exchanges: 1-1/2 starch, 1 vegetable. Based on Academy of Nutrition and Dietetics and American Diabetes Association criteria. Made in the USA. Per 1 Tbsp Dry Mix: 20 calories; 0 g sat fat (0% DV); 610 mg sodium (25% DV); less than 1 g sugars. For more recipes go to: Yummly.com/recipesecrets. Questions or comments? Call 1-877-995-4490. Questions or comments? Please keep this package and call 1-877-995-4490, or write to this address on this package. 90 calories per 1/2 cup. Excellent source of vitamin A. Non-BPA lining. Recyclable. Steel. Please recycle where facilities available. Satisfaction guaranteed. If you have questions or comments, please call 1-800-257-8443. Please have code and date information from container. Visit our website at www.campbellsoup.com. We begin with good, honest ingredients like farm grown carrots, potatoes and corn. Partially produced with genetic engineering. For information about GMO ingredients visit WhatsinMyFood.com. Cooked with care in the USA. No colors from artificial sources. No artificial flavors. Vegetarian. Per 1 Cup Serving: 120 calories; 0 g sat fat (0% DV); 690 mg sodium (29% DV); 14 g sugars. Questions, comments? Save can and call 1-800-200-9377 weekdays 7:30 A.M. to 5:30 P.M. CT. Box Tops for Education. Partially produced with genetic engineering. Learn more at Ask.GeneralMills.com. how2recycle.info. For over 100 years, our kitchens have crafted honest, soul-satisfying recipes with real ingredients you're proud to serve. Visit progresso.com for even more coziness. 1/2 cup of vegetables per serving. Good source of fiber. See nutrition information for sodium content. No MSG added (Except that which occurs naturally in hydrolyzed vegetable proteins and tomato extract). See nutrition information for sodium content. Exchanges: 1-1/2 starch, 1/2 vegetable. Based on Academy of Nutrition and Dietetics and American Diabetes Association criteria. Visit our website at www.Progresso.com. Made in the USA. Soup that eats like a meal. US inspected and passed by Department of Agriculture. Clip & redeem. Earn 1 point for your school! Labels for Education. labelsforeducation.com. Satisfaction guaranteed. Visit our web site at chunky.com. Steel - Please recycle where facilities available. Cooked with care in the USA. 98% fat free. See nutrition information for sodium content. 60 calories per 1/2 cup. Recipes are a click away. CampbellsKitchen.com. Labels For Education: Clip & earn 1 point for your school! labelsforeducation.com. For more recipes, visit: CampbellsKitchen.com. Satisfaction guaranteed. If you have questions or comments, please call 1-800-257-8443. Please have code and date information from container. 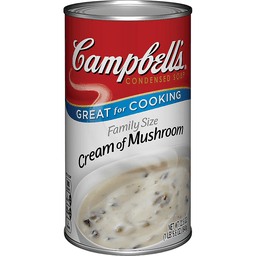 Visit our website at: www.campbellsoup.com. Steel: Please recycle where facilities available. Cooked with care in the USA. 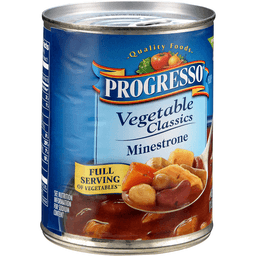 Progresso™ Soup Vegetable Classics Minestrone. No colors from artificial sources. No artificial flavors. Per 1 cup serving: 100 Calories. 0.5g Sat fat, 1% DV. 690mg Sodium, 29% DV. 3g Sugars. Net Wt 19 oz (1 lb 3 oz) 538 g. For over 100 years, our kitchens have crafted honest, soul-satisfying recipes with real ingredients you've proud to serve. 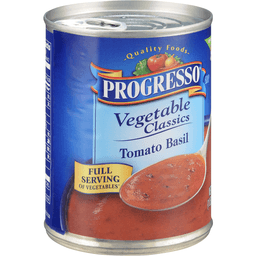 Visit Progresso's website for even more coziness. Vegetarian. 1/2 cup of Vegetables per serving. Good source of fiber. Partially produced with genetic engineering. Learn more at ask.generalmills.com. Exchanges: 1 Starch, 1 vegetable. Based on Academy of Nutrition and Dietetics and American Diabetes Association criteria. how2recycle.info. Questions, Comments Save can and Call: 1-800-200-9377 weekdays 7:30 A.M. to 5:30 P.M. CT. Visit our website at www.progresso.com. © General Mills. 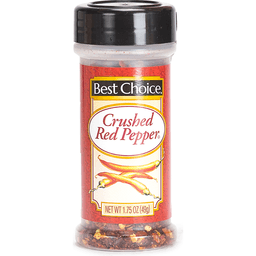 Per 1 Cup Serving: 80 calories; 0 g sat fat (0% DV); 600 mg sodium (25% DV); 4 g sugars. No colors from artificial sources. No artificial flavors. Vegetarian. Partially produced with genetic engineering. Learn more at Ask.GeneralMills.com. Visit our website at www.Progresso.com. Questions, comments? Save can and call 1-800-200-9377 weekdays 7:30 am to 5:30 pm CT. Box Tops for Education. how2recycle.info. For over 100 years, our kitchens have crafted honest, soul-satisfying recipes with real ingredients you're proud to serve. Visit progresso.com for even more coziness. 1/2 cup of vegetables per serving. Good source of fiber. No MSG added (Except that which occurs naturally in yeast extract and hydrolyzed vegetable proteins, and tomato extract). See nutrition information for sodium content. Exchanges: 1/2 starch, 1-1/2 vegetable. Based on Academy of Nutrition and Dietetics and American Diabetes Association criteria. Made in the USA. 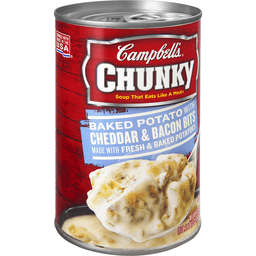 Campbell's® Chunky™ Baked Potato with Cheddar & Bacon Bits Soup, 18.8 oz. 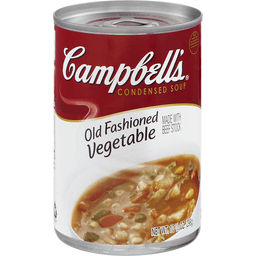 Campbell's® Condensed Old Fashioned Vegetable Soup, 10.5 oz. US inspected and passed by Department of Agriculture. 80 calories per 1/2 cup. Good source of vitamin A. Good source of fiber. Low in fat & cholesterol. Non-BPA lining. Recyclable. Steel. Please recycle where facilities available. Labels for Education: Clip & earn 5 points for your school! labelsforeducation.com. In our soups, we begin with good honest ingredients like farm grown carrots and potatoes. Visit our website at www.campbellsoup.com. Satisfaction guaranteed. If you have questions or comments, please call 1-800-257-8443. Please have code and date information from container. Cooked with care in the USA. Made with beef stock. 70 calories per 1/2 cup. US inspected and passed by Department of Agriculture. The ingredients from corn, soy, sugar and canola in this product come from genetically modified crops. For more information about GMO ingredients, visit: WhatsInMyFood.com. Great for cooking. Questions or comments? Call us at 1-800-257-8443. 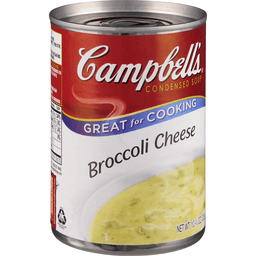 Visit our website at: www.campbells.com. Non-BPA lining. Steel: Please recycle where facilities available. Recyclable. Cooked with care in the USA. In our soups, we begin with good, honest ingredients. Good source of fiber, no artificial flavors, low in fat & cholesterol. Cooked with care in the USA. See nutrition information for sodium content. Per 1/2 Cup: 60 calories. Recipes are a click away. campbellskitchen.com. Clip & earn 1 point for your school! Labels for education. labelsforeducation.com. For more recipes, visit: campbellskitchen.com. Satisfaction guaranteed. If you have questions or comments, please call 1-800-257-8443. Please have code and date information from container. Visit our website at www.campbellsoup.com. Steel: Please recycle where facilities available. Cooked with care in the USA. Natural smoke flavoring added. No artificial flavors. 170 calories per 1/2 cup. Good Source of fiber. Low cholesterol. The ingredients from corn and sugar in this product come from genetically modified crops. For information about GMO ingredients, visit: WhatsInMyFood.com. Questions or comments? Call us at 1-800-257-8443. 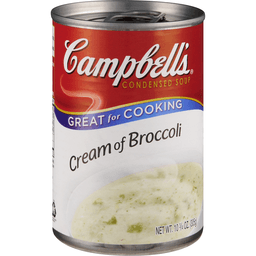 Visit our website at: www.campbellsoup.com. Non-BPA lining. Steel: Please recycle where facilities available. Recyclable. Product of Canada. Soup that eats like a meal. Heart healthy. 100 calories, 0.5 g sat fat (3% DV), 410 mg sodium (17% DV), 4 g sugars per 1 cup. Inspected for wholesomeness by US Department of Agriculture. American Heart Association Certified. Meets criteria for heart-healthy food. 0 g trans fat per serving; heart healthy; low in fat and cholesterol; excellent source of Vitamin A, good source of fiber. While many factors affect heart disease, diets low in saturated fat and cholesterol may reduce the risk of this disease. Clip & redeem. Earn 1 point for your school! Labels for Education, labelsforeducation.com. Steel; please recycle where facilities available. Satisfaction guaranteed. If you have questions of comments, please call. Visit our web site at chunky.com. Cooked with care in the USA. 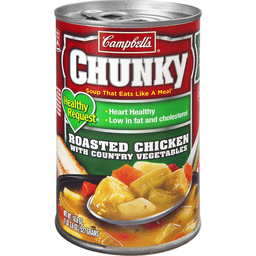 Campbell's® Chunky™ Savory Vegetables Soup, 18.8 oz. 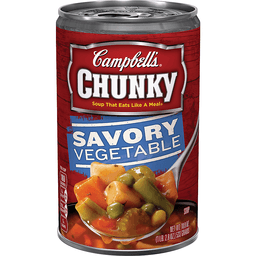 Tackle hunger with Campbell's® Chunky™ Savory Vegetables Soup. Eating your veggies becomes undeniably satisfying with our hearty spoonfuls loaded with potatoes, carrots, corn, green beans and peas in a flavorful tomato broth. 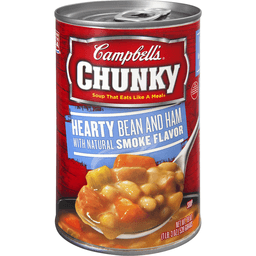 Soup that eats like a meal.® This is not just soup—it’s Chunky™. US inspected and passed by Department of Agriculture. Made with beef stock. 90 calories per 1/2 cup. Excellent source of vitamin A. Non-BPA lining. Recyclable. Steel. Please recycle where facilities available. Satisfaction guaranteed. If you have questions or comments, please call 1-800-257-8443. Please have code and date information from container. Visit our website at www.campbellsoup.com. Labels for Education: Clip & earn 5 points for your school! labelsforeducation.com. We begin with good, honest ingredients like farm grown carrots, potatoes and onions. Then we cook them to perfection to give you the delicious taste you have come to expect from Campbell's. Cooked with care in the USA. Heart healthy. 0 g trans fat per serving. While many factors affect heart disease, diets low in saturated fate and cholesterol may reduce the risk of this disease. Per 1/2 Cup: 60 calories. Delicious. Wholesomeness. Recyclable. Clip & Earn: 1 point for your school! Labels for education. labelsforeducation.com. Steel: Please recycle where facilities available. For more recipes, visit: campbellskitchen.com. American Heart Association Certified: Meets criteria for heart-healthy food. While many factors affect heart disease, diets low in saturated fat and cholesterol may reduce the risk of this disease. Satisfaction guaranteed. If you have questions or comments, please call 1-800-257-8443. Please have code and date information from container. 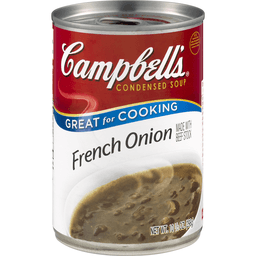 Visit our website at: www.campbellsoup.com. Cooked with care in the USA. Soup that eats like a meal. Heart healthy. 130 calories, 1 g sat fat (5% DV), 410 mg sodium (17% DV), 4 g sugars per 1 cup. US inspected and passed by Department of Agriculture. American Heart Association Certified. Meets criteria for heart-healthy food. 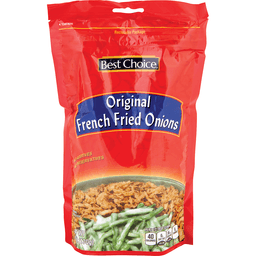 0 g trans fat per serving; heart healthy; low in fat and cholesterol; good source of Vitamin A, good source of fiber. While many factors affect heart disease, diets low in saturated fat and cholesterol may reduce the risk of this disease. Clip & redeem. Earn 1 point for your school! Labels for Education, labelsforeducation.com. Steel; please recycle where facilities available. Satisfaction guaranteed. If you have questions or comments, please call. Visit our web site at chunky.com. Cooked with care in the USA. 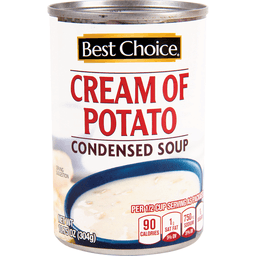 Water, Potatoes, Modified Food Starch, Wheat Flour, Contains Less than 2% of: Dehydrated Whey (Milk), Salt, Cream, Vegetable Oil (Corn, Cottonseed, Canola, and/or Soybean), Dehydrated Potatoes, Dehydrated Onions, Butter (Cream), Monosodium Glutamate, Soy Protein Concentrate, Yeast Extract, Flavoring, Citric Acid. Great for cooking. Per 1/2 Cup: 90 calories. 100% Recyclable. 100% delicious. Satisfaction guaranteed. If you have questions or comments, please call 1-800-257-8443. Please have code and date information from container. Visit our website at: www.campbellsoup.com. Clip & earn 1 point for your school! Labels for education. labelsforeducation.com. For more recipes, visit: campbellskitchen.com. Steel: Please recycle where facilities available. Cooked with care in the USA. 100 calories per 1/2 cup. Great for cooking. Partially produced with genetic engineering. For information about GMO ingredients visit WhatsInMyFood.com. Satisfaction guaranteed. If you have questions or comments, please call 1-800-257-8443. Please have code and date information from container. Visit our website at www.campbellsoup.com. Non-BPA lining. Steel: Please recycle where facilities available. Recyclable. Cooked with care in the USA. No colors from artificial sources. No artificial flavors. Per 1 Cup Serving: 90 calories; 0 g sat fat (0% DV); 690 mg sodium (29% DV); 4 g sugars. Vegetarian. Gluten free. Partially produced with genetic engineering. Learn more at Ask.GeneralMills.com. Visit our website at www.Progresso.com. For over 100 years, our kitchens have crafted honest, soul-satisfying recipes with real ingredients you're proud to serve. Visit progresso.com for even more coziness. 1/2 cup of vegetables per serving. Good source of fiber. See nutrition information for sodium content. Questions, comments? Save can and call 1-800-200-9377 weekdays 7:30 am to 5:30 pm CT. how2recycle.info. Box Tops for Education. Exchanges: 1 starch, 1/2 vegetable. Based on Academy of Nutrition and Dietetics and American Diabetes Association criteria. Made in the USA. 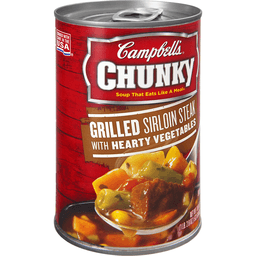 Campbell's® Chunky™ Grilled Sirloin Steak & Hearty Vegetables Soup, 18.8 oz. 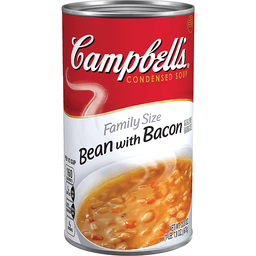 Campbell's® Condensed Family Size Bean with Bacon Soup, 23 oz. 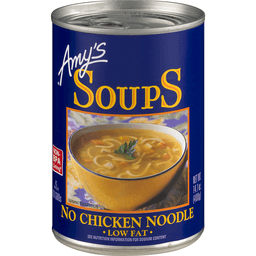 Amy's Soup - No Chicken Noodle - Case of 1 - 14.1 oz. AMY'S ORGANIC LOW FAT NO CHICKEN NOODLE SOUP IS A COZY MEAL FOR THOSE LOOKING TO RECONNECT WITH NATURAL, SIMPLE INGREDIENTS. OUR VERSION OF THE “CURE EVERYTHING” SOUP, IT’S LIGHT, TASTY, COMFORTING AND, OF COURSE, CONTAINS NO CHICKEN. OUR 14.1 OZ. RECIPE IS CRAFTED WITH ORGANIC ONIONS, CARROTS, CELERY AND TOFU. 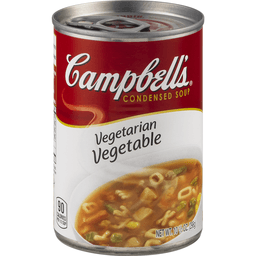 EACH CAN OF ALL-VEGAN SOUP CONTAINS ABSOLUTELY NO PRESERVATIVES WHILE BEING PACKED WITH 2 GRAMS OF DIETARY FIBER AND 5 GRAMS OF PROTEIN PER SERVING. OUR SOUP IS CERTIFIED ORGANIC, NON-GMO AND IS PACKAGED IN NON-BPA LINED CANS, SO YOU CAN BE SURE THAT WHAT YOU GET IS THE REAL DEAL. SEE NUTRITIONAL FACTS PANEL FOR ALLERGENS. AMY’S KITCHEN HAS GROWN BEYOND THE BERLINER FAMILY’S WILDEST DREAMS, GOING FROM SEVERAL FAMILY MEMBERS PITCHING IN ANYWHERE THEY CAN, TO A WONDERFUL GROUP OF EMPLOYEES, FARMERS AND SUPPLIERS. BUT NO MATTER HOW BIG THE COMPANY GROWS, ONE THING WILL ALWAYS REMAIN THE SAME—THE FAMILY SPIRIT THAT PERMEATES EVERY DECISION MADE INSIDE OF AMY’S KITCHEN. 50% less sodium than our regular soup. Light in sodium. Non-BPA lining (Visit us at Amys.com). No GMOs. USDA organic. 100% recyclable. Amy's Kitchen was started when our daughter Amy was born in 1987. We are a family business deeply committed to producing vegetarian natural and organic prepared foods that taste homemade. 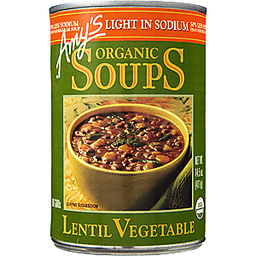 Amy, who is a picky eater, loves this nourishing Lentil Soup made from her mom's favorite recipe. It is high in fiber, a good source of protein and has a rich, satisfying flavor. Responding to customer requests, our chefs have created a line of Light in Sodium soups with all the flavor and goodness of our regular soups, but containing 50% less sodium. 0 g trans fat. No added MSG. No preservatives. No GMOs - No bioengineered ingredients. Gluten free. We like hearing from you. If you have any questions or comments, please write to us. Container is recyclable. Please recycle where facilities exist. Certified vegan. Vegan.org. Ready to serve. 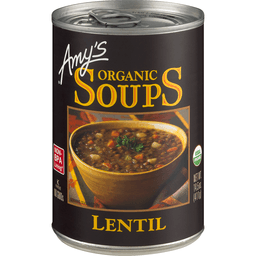 Contains 290 mg of sodium compared to 590 mg in Amy's Regular Lentil Soup. Certified organic by QAI. Quality Assurance International. Certified organic. Made in USA. 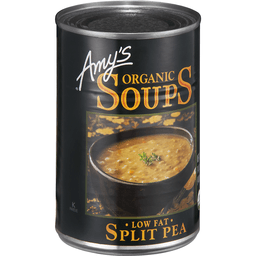 Amy's Soup - Low Fat - Case of 1 - 14.3 oz. 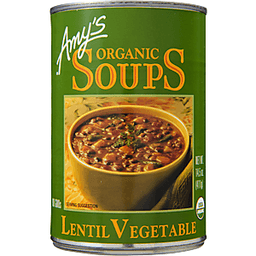 AMY'S ORGANIC LOW FAT CHUNKY VEGETABLE SOUP IS A TREAT FOR THOSE LOOKING TO RECONNECT WITH NATURAL, SIMPLE INGREDIENTS. CHUNKS OF TENDER ORGANIC VEGETABLES IN A FLAVORFUL BROTH GIVE THIS SOUP A SATISFYING HOMEMADE TASTE, AND ALL BECAUSE OUR 14.3 OZ. 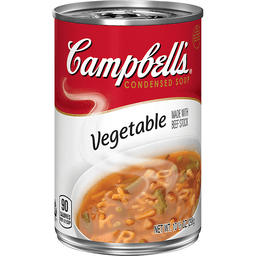 CANS OF SOUP ARE CRAFTED WITH ORGANIC DICED TOMATOES, SPINACH, CARROTS, GREEN BEANS, CORN, PEAS, ONIONS AND CELERY. 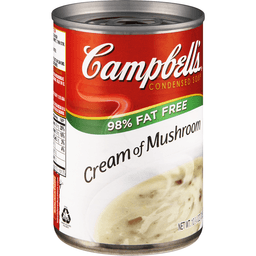 EACH CAN OF LOW-FAT, ALL-VEGAN SOUP IS PACKED WITH 3 GRAMS OF DIETARY FIBER AND PROTEIN PER SERVING. OUR SOUP IS USDA-CERTIFIED ORGANIC, NON-GMO AND IS PACKAGED IN A NON-BPA LINED CAN, SO YOU CAN BE SURE THAT WHAT YOU GET IS THE REAL DEAL. SEE NUTRITIONAL FACTS PANEL FOR ALLERGENS. AMY’S KITCHEN HAS GROWN BEYOND THE BERLINER FAMILY’S WILDEST DREAMS, GOING FROM SEVERAL FAMILY MEMBERS PITCHING IN ANYWHERE THEY CAN, TO A WONDERFUL GROUP OF EMPLOYEES, FARMERS AND SUPPLIERS. BUT NO MATTER HOW BIG THE COMPANY GROWS, ONE THING WILL ALWAYS REMAIN THE SAME—THE FAMILY SPIRIT THAT PERMEATES EVERY DECISION MADE INSIDE OF AMY’S KITCHEN. Per 1-2/3 Tbsp Dry Mix: 35 calories; 0 g sat fat (0% DV); 700 mg sodium (29% DV); 0 g sugars. For more recipes go to: Yummly.com/recipesecrets. Questions or comments? Call 1-877-995-4490. A Unilever Brand: Questions or comments? Please keep this package and call 1-877-995-4490, or write to the address on this package. Great for cooking. 90 calories per 1/2 cup. Recipes are a click away. CambellsKitchen.com. 100% recyclable. Satisfaction guaranteed. 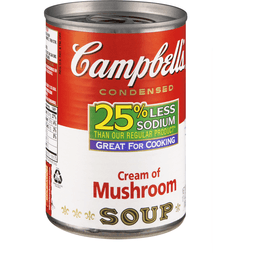 Visit our website at: www.campbellsoup.com. Clip & earn 1 point for your school! Labels for Education. labelsforeducation.com. For more recipes, visit: CampbellsKitchen.com. Steel - Please recycle where facilities available. Cooked with care in the USA. 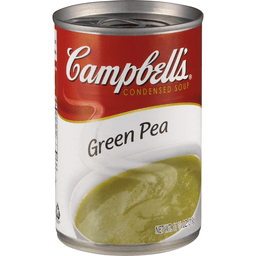 Campbell's® Condensed Cream of Asparagus Soup, 10.5 oz. 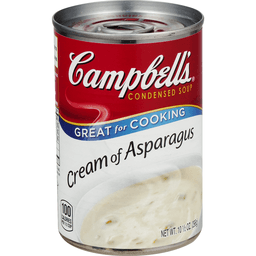 Campbell's® Condensed Cream of Asparagus Soup is a delicately seasoned soup made with tender asparagus and fresh cream. Savor creamy bowls on their own or incorporate our soup into show-stopping recipes that crave a rich boost. Kickstart your cooking inspiration by visiting CampbellsKitchen.com—over 1,000 recipes like Lemon Asparagus Chicken and Ham Asparagus Gratin available. Great for cooking. Recipes are a click away. Visit CampbellsKitchen.com. Great for cooking. Per 1/2 Cup: 100 calories; 1 g sat fat (5% DV); 870 mg sodium (36% DV); 1 g sugars. Satisfaction guaranteed. If you have questions or comments, please call 1-800-257-8443. Please have code and date information from container. 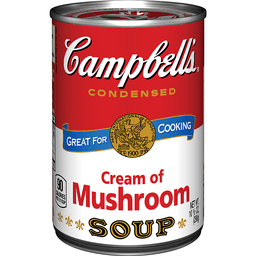 Visit our website at: www.campbellsoup.com. labelsforeducation.com. Clip & earn 1 point for your school! Labels for Education. Steel: Please recycle where facilities available. For this recipe and more, visit: CampbellsKitchen.com. Cooked with care in the USA. 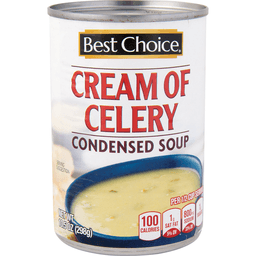 25% less sodium than our regular product (this product contains 650 mg of sodium versus 870 mg for our comparable condensed soup). Great for cooking. 110 calories per 1/2 cup. Recipes are a click away. CampbellsKitchen.com. Labels For Education: Clip & earn 1 point for your school! labelsforeducation.com. For more recipes, visit: CampbellsKitchen.com. Satisfaction guaranteed. If you have questions or comments, please call 1-800-257-8443. Please have code and date information from container. Visit our website at: www.campbellsoup.com. Steel: Please recycle where facilities available. Cooked with care in the USA. Great for cooking. 90 calories per 1/2 cup. 100% delicious. 100% recyclable. Satisfaction guaranteed. If you have questions or comments, please call 1-800-257-8443. Please have code and date information from container. Visit our website at: www.campbellsoup.com. Clip & Earn: 1 point for your school! Labels for Education. labelsforeducation.com. For more recipes, visit: CampbellsKitchen.com. Steel. Please recycle where facilities available. Cooked with care in the USA. Soup that eats like a meal. US inspected and passed by Department of Agriculture. 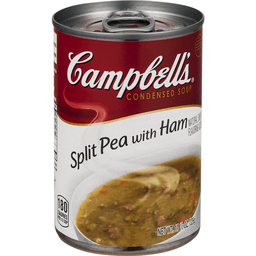 The official soup and chili sponsor of the NFL. Visit our web site at chunky.com. Satisfaction guaranteed. Steel - Please recycle where facilities available. Cooked with care in the USA. All natural. Fortified with vitamins, minerals and prebiotics to support digestion. Certified gluten-free. Non-BPA lining (Can lining not derived from BPA). Great taste and good nutrition - Gluten Free Cafe Soups are the first line of gluten free soups fortified with vitamins, minerals and prebiotics. Vitamins like B1, B2, B3, folic acid and vitamin D. Minerals such as iron and calcium. Inulin, a prebiotic fiber. Gluten Free Cafe brand is certified by the Gluten Free Certification Organization (GFCO.org), a program of the Gluten Intolerance Group. The GFCO logo stands for the independent verification of quality, integrity and purity of products. Products carrying this logo meet strict gluten free standards, and are certified to have 10 ppm (parts per million) of gluten or less. For tips on gluten free living please visit up at myglutenfreecafe.com. Comments? 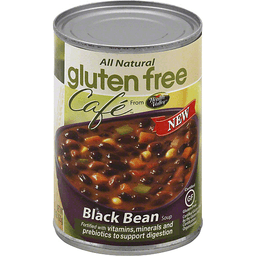 1-800-434-4246. glutenfreechoices.com. Per 1-2/3 Tbsp Dry Mix: 30 calories; 0 g sat fat (0% DV); 580 mg sodium (24% DV); 3 g sugars. For more recipes go to: Yummly.com/recipesecrets. Questions or comments? Call 1-877-995-4490. A Unilever Brand: Questions or comments? Please keep this package and call 1-877-995-4490, or write to the address on this package. 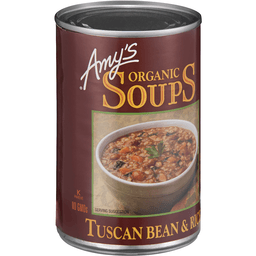 Amy's Soup - Semi-Condensed - Case of 1 - 14.1 oz. 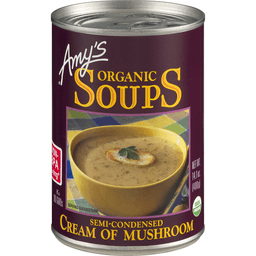 AMY'S ORGANIC SEMI-CONDENSED CREAM OF MUSHROOM SOUP IS A COZY MEAL FOR THOSE LOOKING TO RECONNECT WITH NATURAL, SIMPLE INGREDIENTS. 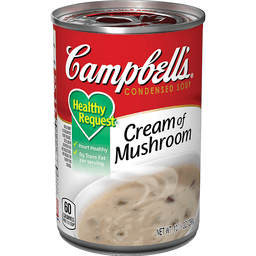 THIS CREAMY MUSHROOM SOUP CAN BE DILUTED TO TASTE AND SERVED AS A SOUP OR ON YOUR FAVORITE CASSEROLE. OUR 14.1 OZ. RECIPE IS CRAFTED WITH ORGANIC MUSHROOMS, ONIONS, LEEKS, BUTTER AND CREAM. 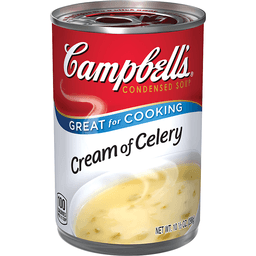 FREE OF RBST HORMONES, EACH CAN OF SOUP CONTAINS ABSOLUTELY NO PRESERVATIVES WHILE BEING PACKED WITH 2 GRAMS OF DIETARY FIBER AND 3 GRAMS OF PROTEIN PER SERVING. OUR SOUP IS USDA-CERTIFIED ORGANIC, NON-GMO AND IS PACKAGED IN NON-BPA LINED CANS, SO YOU CAN BE SURE THAT WHAT YOU GET IS THE REAL DEAL. SEE NUTRITIONAL FACTS PANEL FOR ALLERGENS. AMY’S KITCHEN HAS GROWN BEYOND THE BERLINER FAMILY’S WILDEST DREAMS, GOING FROM SEVERAL FAMILY MEMBERS PITCHING IN ANYWHERE THEY CAN, TO A WONDERFUL GROUP OF EMPLOYEES, FARMERS AND SUPPLIERS. BUT NO MATTER HOW BIG THE COMPANY GROWS, ONE THING WILL ALWAYS REMAIN THE SAME—THE FAMILY SPIRIT THAT PERMEATES EVERY DECISION MADE INSIDE OF AMY’S KITCHEN. 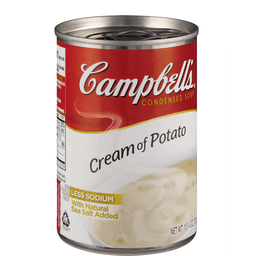 At least 33% fewer calories than the leading potato, cheese, and bacon ready-to-serve soup. See nutrition information for sodium content. Per 1 Cup Serving: 100 calories; 1 g sat fat (4% DV); 690 mg sodium (29% DV); 2 g sugars. 100 calories per serving. No artificial flavors. Questions, comments? Save can and call 1-800-200-9377 weekdays 7:30 am to 5:30 pm CT. Partially produced with genetic engineering. Learn more at Ask.GeneralMills.com. how2recycle.info. Box Tops for Education. Visit our website at www.progresso.com. 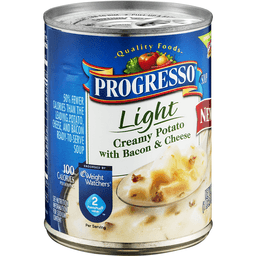 Progresso Light: 100 calories, 3 g fat. 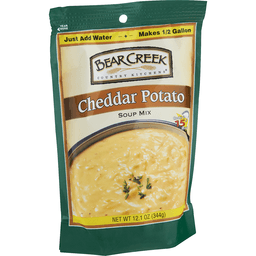 Leading potato cheese, and bacon ready-to-serve soup: 190 calories, 9 g fat. For over 100 years, our kitchens have crafted honest, soul-satisfying recipes with real ingredients you're proud to serve. 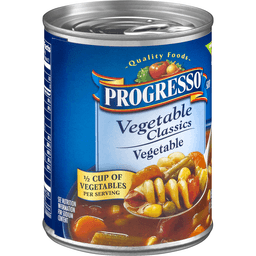 Visit progresso.com for even more coziness. No MSG added (Except that which occurs naturally in yeast extract and hydrolyzed vegetable proteins.). Low fat. Exchanges: 1/2 fat, 1 starch. Based on Academy of Nutrition and Dietetics and American Diabetes Association criteria. Made in the USA. Cooks in 12 minutes. No artificial flavors. Per 2 Tbsp Dry Mix: 60 calories; 0 g sat fat (0% DV); 690 mg sodium (29% DV); less than 1 g sugars. Unilever. For great recipe ideas, visit yummly.com/knorr. Facebook: Like us at facebook/knorr. Don't hesitate to contact us at: 1-800-457-7082. 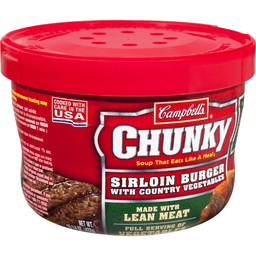 Campbell's® Chunky™ Sirloin Burger with Country Vegetables Soup Microwavable Bowl, 15.25 oz. 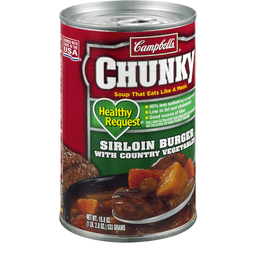 Campbell's ® Chunky™ Sirloin Burger with Country Vegetables Soup Microwavable Bowl is crafted with big pieces of seasoned sirloin and hearty veggies like carrots, potatoes, green beans and peas to create a flavorful recipe that satisfies and fills you up. Conveniently packed in a portable microwavable bowl, fuel your everyday hustle on the go with our hearty spoonfuls. Soup That Eats Like a Meal® Easy peel opening. Ready in minutes! 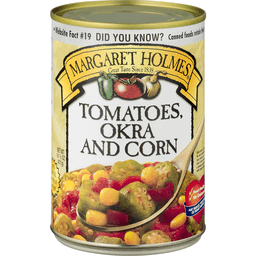 Margaret Holmes® Tomatoes, Okra and Corn. Great taste since 1838. 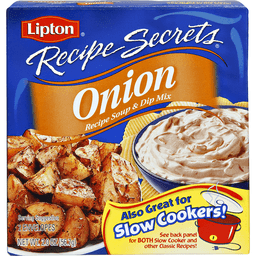 Great side dish, soup mix or over rice! Website fact #19. 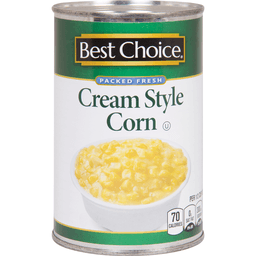 Did you know Canned foods retain their nutritional value better than fresh and frozen foods! Diets low in saturated fat and cholesterol may reduce your risk of heart disease, a disease associated with many factors. Heart healthy. No cholesterol. May reduce your risk of heart disease. Recipes, meal ideas, canned food facts... Cans: Infinitely Recyclable™. Want to know more Check out our all-new website! www.margaretholmes.com. For questions or comments please email us at customerservice@mccallfarms.com or call 1-800-277-2012 ext 131. 8 - one cup servings. Great cheese flavor, hearty potatoes. This soup tastes like you made it from scratch. Just add water. Great taste! Cooks in 15 minutes. 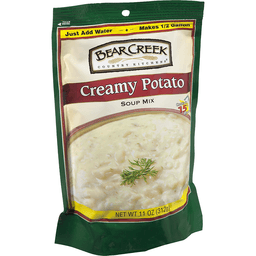 www.bearcreeksoups.com. High in the Heber Valley of the Wasatch Mountains, Bear Creek Country Kitchens began with one goal in mind: Deliver great hearty homestyle dishes that the whole family will enjoy. Combining high quality hearty ingredients with our special blend of spices, our soups are delicious, yet easy to prepare. Just add water and in minutes you can serve homemade soups that will satisfy every appetite. Cooks in 12 minutes. No artificial flavors. 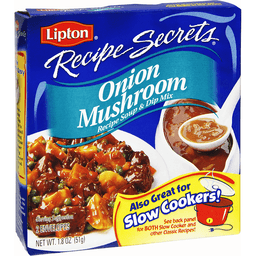 Per 2 Tbsp Dry Mix: 45 minutes; 0 g sat fat (0% DV); 680 mg sodium (28% DV); 1 g sugars. Unilever. For great recipe ideas, visit yummly.com/knorr. 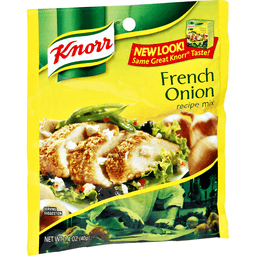 Facebook: Like us at facebook/knorr. Don't hesitate to contact us at: 1-800-457-7082. 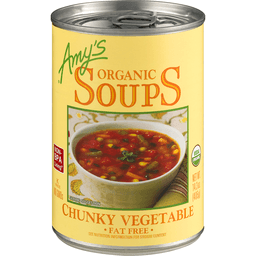 Amy's® Organic Soup Butternut Squash Low Fat. 50% Less sodium than our regular butternut squash soup. Light in sodium. USDA Organic. Non-BPA lining*. Net Wt. 14.1 oz. (400 g). Amy's kitchen was started when our daughter Amy was born in 1987. We are a family business deeply committed to producing organic foods made with highest quality ingredients. Smooth, mellow blended organic butternut squash...delicious as is or use as a base for your own creations. Responding to customer requests, our chefs have created a line of "Light in Sodium" soups with all the flavor and goodness of our regular butternut squash soups, but containing 50% less sodium. 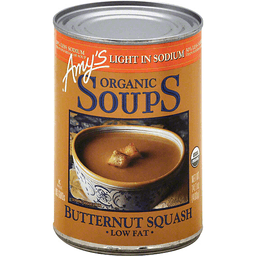 Contains 290mg of sodium compared to 580mg in Amy's regular butternut squash soup. Amy's kitchen does not use any peanuts, fish, shellfish or eggs. Ready to serve. No GMOs - No genetically engineered ingredients. No preservatives. Certified Vegan. Certified Organic by Quality Assurance International (QAI). 100% Recyclable. Container is recyclable. Please recycle where facilities exist. We like hearing from you. If you have any Questions or Comments, please write to us. *Visit us at www.amys.com. © Amy's Kitchen. 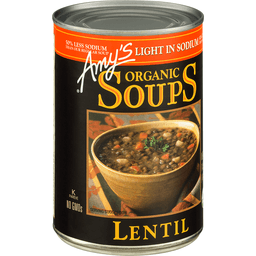 AMY’S ORGANIC LENTIL SOUP IS A COZY MEAL FOR THOSE LOOKING TO RECONNECT WITH NATURAL, SIMPLE INGREDIENTS. HIGH IN FIBER AND A GOOD SOURCE OF PROTEIN, OUR 14.5 OZ. 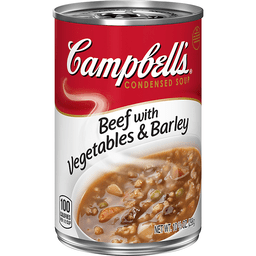 CAN OF SOUP IS CRAFTED WITH ORGANIC LENTILS, CARROTS, CELERY, LENTILS, ONIONS AND POTATOES. 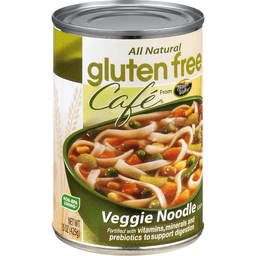 EACH CAN OF GLUTEN-FREE, ALL-VEGAN SOUP CONTAINS ABSOLUTELY NO PRESERVATIVES WHILE BEING PACKED WITH 6 GRAMS OF DIETARY FIBER AND 8 GRAMS OF PROTEIN PER SERVING. OUR SOUP IS USDA-CERTIFIED ORGANIC, NON-GMO AND IS PACKAGED IN NON-BPA LINED CANS, SO YOU CAN BE SURE THAT WHAT YOU GET IS THE REAL DEAL. SEE NUTRITIONAL FACTS PANEL FOR ALLERGENS. AMY’S KITCHEN HAS GROWN BEYOND THE BERLINER FAMILY’S WILDEST DREAMS, GOING FROM SEVERAL FAMILY MEMBERS PITCHING IN ANYWHERE THEY CAN, TO A WONDERFUL GROUP OF EMPLOYEES, FARMERS AND SUPPLIERS. BUT NO MATTER HOW BIG THE COMPANY GROWS, ONE THING WILL ALWAYS REMAIN THE SAME—THE FAMILY SPIRIT THAT PERMEATES EVERY DECISION MADE INSIDE OF AMY’S KITCHEN. Old-world Italian taste with pasta and veggies in rich beef stock and rustic flavors the whole family will love. Makes 8 servings. 1/2 gallon. Cooks in 15 minutes. Just add water. The super hearty soup mix. Since our early beginnings high in the Heber Valley of the Wasatch Mountains, Bear Creek Country Kitchens has delivered great hearty homestyle dishes that the whole family will enjoy. Just add water and in minutes, you can serve homemade soups that will satisfy every appetite. Another Twist on a Classic: Beefy Minestrone. Brown ground beef, add Bear Creek Minestrone soup mix and water and simmer until done. Try this recipe suggestion. Questions/comments? (800) 813-3654. Visit us online at www.BearCreekCountryKitchens.com. Facebook. Twitter. Instagram. 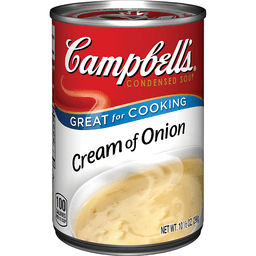 Campbell's® Condensed Cream of Onion Soup, 10.5 oz. 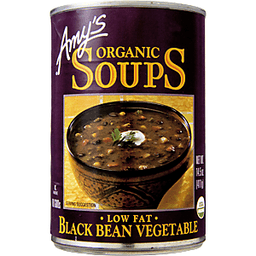 Amy's Soup Black Bean Vegetable - Case of 14.5 - 14.5 oz. 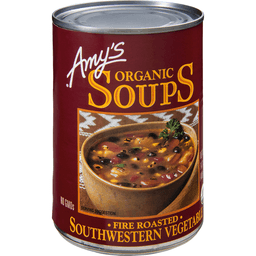 AMY'S ORGANIC LOW FAT BLACK BEAN VEGETABLE SOUP IS A TREAT FOR THOSE LOOKING TO RECONNECT WITH NATURAL, SIMPLE INGREDIENTS. INSPIRED BY THE BLACK BEAN SOUP SERVED AT HOTEL SANTÉ FE IN PUERTO ESCONDIDO, MEXICO, OUR 14.5 OZ. RECIPE IS CRAFTED WITH ORGANIC BLACK BEANS, ONIONS, CARROTS, CORN, POTATOES, CELERY AND LEEKS. 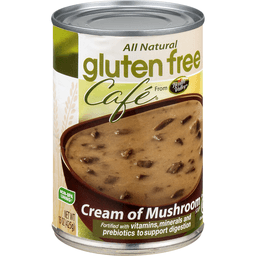 EACH CAN OF GLUTEN-FREE, ALL-VEGAN SOUP CONTAINS ABSOLUTELY NO PRESERVATIVES WHILE BEING PACKED WITH 5 GRAMS OF DIETARY FIBER AND 6 GRAMS OF PROTEIN PER SERVING. OUR SOUP IS USDA-CERTIFIED ORGANIC, NON-GMO AND IS PACKAGED IN NON-BPA LINED CANS, SO YOU CAN BE SURE THAT WHAT YOU GET IS THE REAL DEAL. SEE NUTRITIONAL FACTS PANEL FOR ALLERGENS. AMY’S KITCHEN HAS GROWN BEYOND THE BERLINER FAMILY’S WILDEST DREAMS, GOING FROM SEVERAL FAMILY MEMBERS PITCHING IN ANYWHERE THEY CAN, TO A WONDERFUL GROUP OF EMPLOYEES, FARMERS AND SUPPLIERS. ONE THING WILL ALWAYS REMAIN THE SAME—THE FAMILY SPIRIT THAT PERMEATES EVERY DECISION MADE INSIDE OF AMY’S KITCHEN. 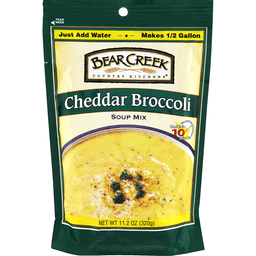 Velvety smooth cheddar flavor and loaded with broccoli, always a comforting family favorite. Makes 8 servings. 1/2 gallon. Cooks in 10 minutes. Just add water. The super hearty soup mix. Since our early beginnings high in the Heber Valley of the Wasatch Mountains, Bear Creek Country Kitchens has delivered great hearty homestyle dishes that the whole family will enjoy. Just add water and in minutes, you can serve homemade soups that will satisfy every appetite. Questions/comments? (800) 813-3654. Visit us online at www.BearCreekCountryKitchens.com. Facebook. Twitter. Instagram. All natural. USDA Organic. Great recipes start here! 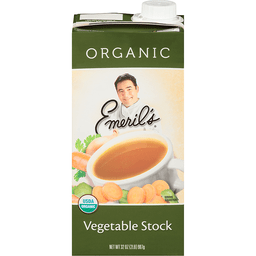 Use Emeril's Stock instead of water when simmering vegetables, rice and potatoes. For more recipe ideas visit www.bestemeril.com. When someone asks me for cooking advice, I tell them invest in stock! Not the financial kind, the chicken, beef and vegetable kind. I know most people don't have time to make their own stock. So I figured I would help them out by making the same kinds of stocks I use in my restaurants. To make my stocks rich and flavorful, we simmer them with only the best ingredients. If it's not found in nature, you won't find it in here. Then we pack them up, and BAM! You've got my restaurant quality stock ready to use in your home. My veggie stock is perfect for adding great flavor to all your vegetarian meals. Use it in place of water when you're making rice and couscous. Or try my recipe for Creole-Style Tomato Soup, it's out of this world! Vegetable stock is a perfect complement to seafood dishes too! The possibilities are limited only by your imagination. Visit www.bestemeril.com for more of my recipes and other great tips. Questions or Comments? Consumer Affairs; PO Box K, Roseland, NJ 07068. When writing us please include code number on package. Ready to use. Certified organic by QAI. Find us on Facebook. Proudly made in the USA. 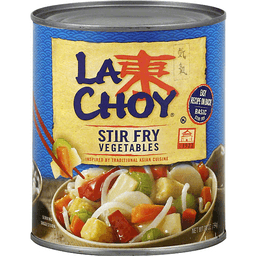 La Choy® Stir Fry Vegetables. Easy recipe on back! Basic stir fry. Est. 1922. Inspired by traditional Asian cuisine. Net wt 28 oz (794g). La Choy® has created authentic and easy to prepare Asian foods for over 80 years. Our flavorful sauces, traditional vegetables, crunchy noodles and complete meals are a convenient and delicious way to add variety to your everyday meals. Questions and comments Please contact us at La Choy Consumer Affairs, 1-800-252-0672. Let us show you how at www.lachoy.com. For authentic, delicious and easy Asian recipes, please visit us at www.lachoy.com. Per 1 Cup: 120 calories; 2.5 g sat fat (13% DV); 850 mg sodium (35% DV); 7 g sugars. USDA organic. Live/love/eat. Make Wolfgang Puck proud and take your time to enjoy this Hearty Vegetable Soup by garnishing it with basil and croutons. 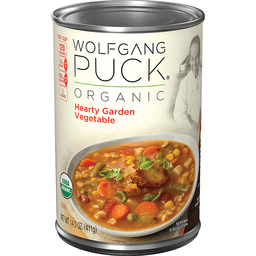 - Wolfgang Puck. Find recipes & more information at www.wolfgangpuck.com. 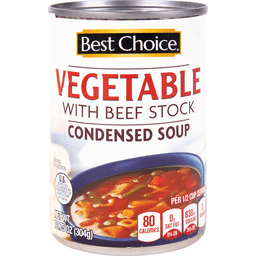 1 serving of vegetables (1 cup soup provides 1 serving (1/2 cup) of vegetables. The Dietary Guidelines recommend 2-1/2 cups of a variety of vegetables per day for a 2,000 calorie diet). Vegetarian. Satisfaction guaranteed. If you have questions or comments, please call 1-877-226-7235. Please have code and date information from container. Certified organic by California Certified Organic Farmers. 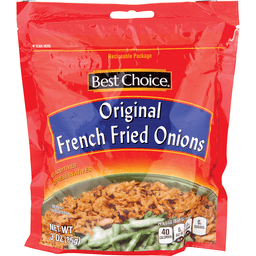 Per 1 Cup: 170 calories; 7 g sat fat (35% DV); 650 mg sodium (27% DV); 8 g sugars. USDA organic. Gluten free. Live/love/eat. Make Wolfgang Puck proud and take your time to enjoy this Signature Butternut Squash by garnishing it with cranberry relish and a sprinkle of nutmeg. 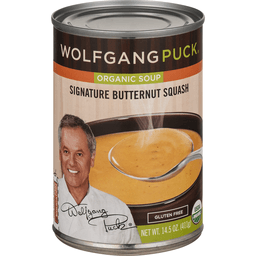 - Wolfgang Puck. Find recipes & more information at www.wolfgangpuck.com. Satisfaction guaranteed. If you have questions or comments, please call 1-877-7235. Please have code and date information from container. Certified organic by California Certified Organic Farmers. Great for cooking. Per 1/2 Cup: 100 calories. 100% Delicious. Recyclable. Clip & Earn: 1 Point for your school! Labels for education. labelsforeducation.com. 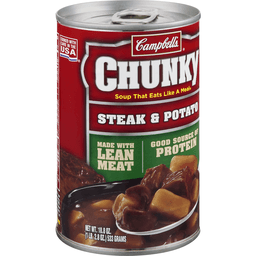 Visit our web site at: www.campbellsoup.com. Satisfaction guaranteed. If you have questions or comments, please call 1-800-257-8443. Please have code and date information from container. 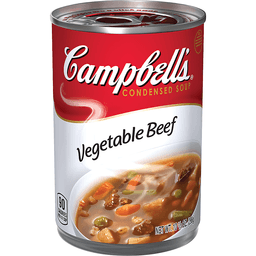 Visit our website at: www.campbellsoup.com. Steel: Please recycle where facilities available. Cooked with care in the USA. Delicious and nutritious. An employee-owned company. To your good health. Bob Moore. Friend of the heart. You can see our quality! 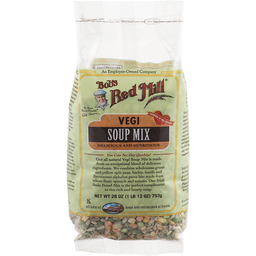 Our natural Vegi Soup Mix is made from an exceptional blend of delicious ingredients. We combine wholesome green and yellow split peas, barley, lentils and flavorsome alphabet pasta bits made from wheat flour, spinach and tomato. 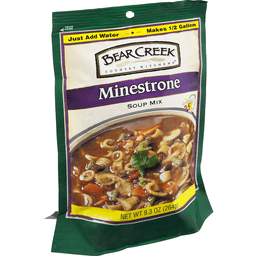 Our Irish Soda Bread Mix is the perfect complement to this rich and hearty soup. Beans, peas, and lentils are natural agricultural products. Our product line is diverse and extensive. For information and recipes, visit our website at www.bobsredmill.com. Write for a brochure or product list: Bob's Red Mill Natural Foods, Inc. 13521 SE Pheasant Court, Milwaukie, Oregon 97222. History in the Making. Bob's Red Mill is dedicated to making natural foods in the natural way. That's why we carefully stone grind our grains in the simple and traditional way used by discriminating millers since early Roman times. With all the sophisticated technology of recent times, no machinery has yet been developed that grind grains quite as well as our flint-hard quartz millstones. The granulation produced by stone grinding is far superior and the cool temperature of the process preserves valuable nutrients that are lost in conventional, high speed milling methods. We stone grind the widest possible variety of grains into flours and meals on our century-old mills. We mix them into an astounding array of delicious fours, cereals, and pancake, muffin and bread mixes. We also have a line of gluten-free products that are made in a dedicated facility and exhaustively tested for purity. We add to the list continually, making our product line of healthy grain-based foods the most complete in the world. Delight you and yours today with our stone ground goodness and know that you're eating the finest grain products available anywhere. To your good health, Bob Moore. Bob's Red Mill also manufactures the largest selection of whole grain foods available anywhere, including (but not limited to): Flaxseed Meal. 5 Grain Cereal. Cornmeal. Whole Wheat Flour. Scottish Oatmeal. Soy Flour. 10 Grain Bread Mix. Quinoa Grain. If you do not see these products in your store, ask for them. Made in the USA. 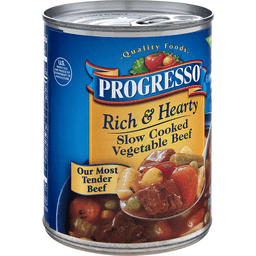 Progresso™ Rich & Hearty Slow Cooked Vegetable Beef Soup. Gluten free. No artificial flavors. Per 1 Cup serving: 120 Calories. 1.5g sat fat, 7% DV. 680mg sodium, 28% DV. 4g sugars. U.S. inspected and passed by Department of Agriculture. Exchanges: 1 starch, 1/2 medium fat meat based on Academy of Nutrition and Dietetics and American Diabetics Association criteria. Visit our website at www.progresso.com. Questions, comments Rinse & insert lid. Metal-can. how2recycle.info. For over 100 years, our kitchens have crafted honest, soul-satisfying recipes with real ingredients you're proud to serve. Visit progresso.com for even more coziness. No MSG added*. *Except that which occurs naturally in yeast extract and hydrolyzed vegetable proteins. Save can and call. 1-800-200-9377 weekdays 7:30 A.M. to 5:30 P.M. CT. ©General Mills. One cup. 8 servings. Great taste! 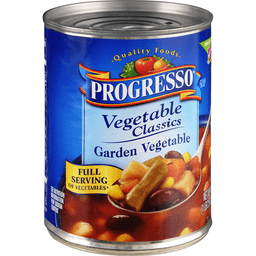 A hearty blend of pinto and red beans and vegetables with a fiesta of seasonings. Cooks in 15 minutes. High in the Heber Valley of the Wasatch Mountains, Bear Creek Country Kitchens began with one goal in mind: Deliver great hearty homestyle dishes that the whole family will enjoy. Combining high quality hearty ingredients with our special blend of spices, our soups are delicious, yet easy to prepare. Just add water and in minutes you can serve homemade soups that will satisfy every appetite. 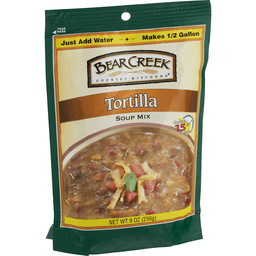 www.bearcreeksoups.com. Slow-cooked homestyle flavor crafted with delicate herbs and savory spices, a classic and creamy favorite. Makes 8 servings. 1/2 gallon. Cooks in 15 minutes. Just add water. The super hearty soup mix. Since our early beginnings high in the Heber Valley of the Wasatch Mountains, Bear Creek Country Kitchens has delivered great hearty homestyle dishes that the whole family will enjoy. Just add water and in minutes, you can serve homemade soups that will satisfy every appetite. Questions/comments? (800) 813-3654. Visit us online at www.BearCreekCountryKitchens.com. Facebook. Twitter. Instagram. New look! USDA organic. Non GMO Project verified. nongmoproject.org. It starts with real ingredients. 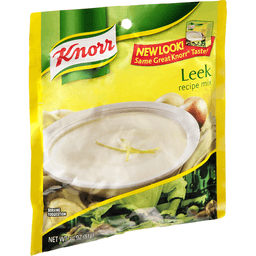 Imagine farm-fresh organic potatoes, sauteed leeks, and roasted garlic combined in a velvety broth that's delicately seasoned with premium herbs and spices. It's a home-style favorite updated for the modern palate. Imagine the Possibilities: Scatter on shredded carrots and diced scallions for a garden-fresh flavor. Flavor-up your layered potato casserole by using as a substitute for cream. Our Commitment to You: organic certified; non-GMO project verified; vegan; non-dairy; gluten free; no added msg; no artificial ingredients or preservatives. 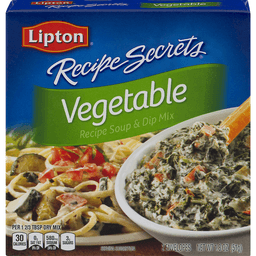 Contains 1 serving of vegetables (USDA MyPyramid. One-half cup of vegetables = 1 serving) per cup. Enjoy all our delicious Imagine brand products. www.imaginefoods.com. Join the Foodie Conversation: Facebook: facebook.com/imaginesoups. A package from Tetra Pak. It starts with real ingredients. Every Imagine Creamy Soup starts with the finest farm-grown vegetables, harvested at the peak of freshness and expertly blended with select herbs and spices. Our commitment to using premium ingredients comes through in every spoonful - so you can serve the rich, authentic flavors of homemade every day of the week. Recyclable only where facilities exist. Visit recyclecartons.com to see if recyclable in your area. Tetra Pak: Protects what's good. Certified organic by Quality Assurance International. Comments? Please send UPC and Manufactured Code Date along with your comments to: Imagine Consumer Relations, 4600 Sleepytime Drive, Boulder, CO 80301 or call: 800-333-6339 or visit www.imaginefoods.com. Made in California. No artificial flavors. Per 2 Tbsp Dry Mix: 25 calories; 0 g sat fat (0% DV); 530 mg sodium (22% DV) 1 g sugars. No artificial flavors. Cooks in 17 minutes. For great recipe ideas, visit yummly.com/knorr. 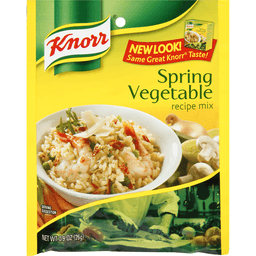 Facebook: Like us at facebook/knorr. Don't hesitate to contact us at: 1-800-457-7082. An employee-owned company. To your good health. Friend of the heart. Pride of the mill. You can see the quality! 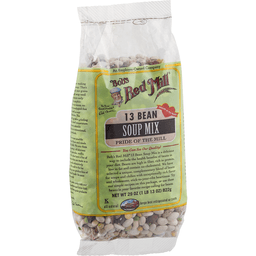 Bob's Red Mill 13 Bean Soup Mix is a delicious way to include the health benefits of beans in your diet. Beans are high in fiber, rich in protein, low in fat and contain no cholesterol. 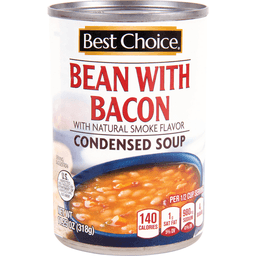 We have selected a unique, complementary blend of beans for soups and chilies with exceptionally rich flavor and wholesome, stick-to-your-rib heartiness. Use these beans for your favorite recipe calling for beans. All natural. Keeps best refrigerated or frozen. Our product line is diverse and extensive. For information and recipes, visit our website at www.bobsredmill.com. History in The Making: Bob's Red Mill is dedicated to making natural foods in the natural way. That's why we carefully stone grind our grains in the simple and traditional way used by discriminating millers since early Roman times. With all the sophisticated technology of recent times, no machinery has yet been developed that grinds grains quite as well as our flint-hard quartz millstones. The granulation produced by stone grinding is far superior and the cool temperature of the process preserves valuable nutrients that are lost in conventional high speed milling methods. We stone grind the widest possible variety of grains into flours and meals on our century-old mills. We mix them into an astounding array of delicious flours, cereals, and pancake muffin and bread mixes. We also have a line of gluten-free products that are made in a dedicated facility and exhaustively tested for purity. We add to the list continually, making our product line of healthy grain-foods the most complete in the world. Delight you and yours today with out stone ground goodness and know that you're eating the finest grain products available anywhere. To your health, Bob Moore. Bob's Red Mill also manufactures the largest selection of whole grain foods available anywhere, including (but not limited to): Flaxseed Meal, 5 Grain Cereal, Cornmeal, Whole Wheat Flour, Scottish Oatmeal, Soy Flour, 10 Grain Bread Mix, Quinoa Grain. If you do not see these products in your store, ask for them. Made in the USA. 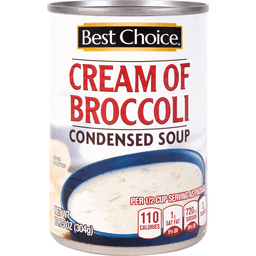 Imagine™ Organic Broccoli Creamy Soup. New look! New recipe! USDA organic. Non GMO project. Verified. nongmoproject.org. A package from Tetra Pak. It starts with real ingredients. 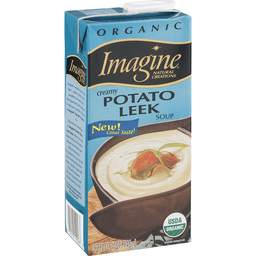 Every Imagine® creamy soup starts with the finest farm-grown vegetables, harvested at the peak of freshness and expertly blended with select herbs and spices. Our commitment to using premium ingredients comes through in every spoonful – so you can serve the rich, authentic flavors of homemade every day of the week. Recyclable only where facilities exist. Visit recyclecartons.com to see if recyclable in your area. It starts with real ingredients. 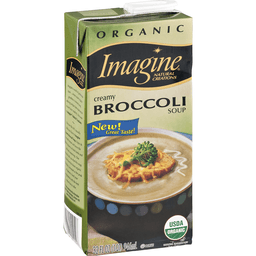 Imagine® garden-fresh organic broccoli paired with garlic and onions in a rich, velvety vegetable stock. It's a satisfying country-style soup with the authentic taste of homemade. Imagine the Possibilities™: Add a handful of mini broccoli florets and shredded cheddar cheese. Mix with sour cream for a quick, garden-fresh vegetable dip. Our commitment to you: Organic certified. Non-GMO project verified. Vegan. Non-dairy. Gluten free. No added MSG. No artificial ingredients or preservatives. 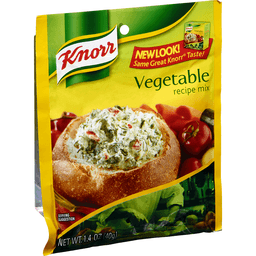 1 contains serving of vegetables* per cup. *USDA MyPyramid. One-half cup of vegetables = 1 serving. Enjoy all our delicious Imagine® brand products. 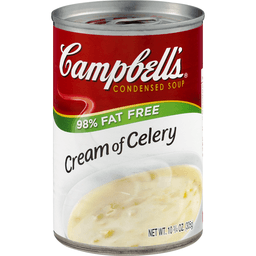 Creamy soups regular & light in sodium. Broths regular & low sodium. 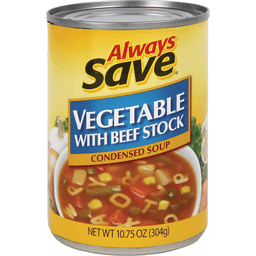 Cooking stocks regular & low sodium. Chunky style soups. Gravies. Culinary simmer sauces. Imagine, potato quinoa & spinach. Imagine, thai coconut curry. Imagine, roasted turkey. Imagine, chicken broth. It starts with real ingredients. www.imaginefoods.com. Tetra Pak®. Protects what's good. Hain Celestial®. Certified organic by Quality Assurance International. Tetra Pak®. Tetra Brik® Aseptic. Comments Please send UPC and manufactured code date along with your comments to: Imagine® Consumer Relations: 4600 Sleepytime Drive, Boulder, CO 80301 or call: 800-333-6339 or visit www.imaginefoods.com. 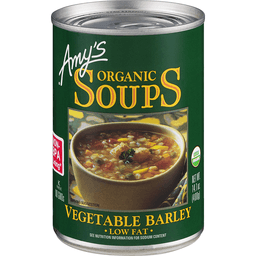 © 2015 The Hain Celestial Group, Inc.
Amy's Soup - Low Fat - Case of 1 - 14.1 oz. 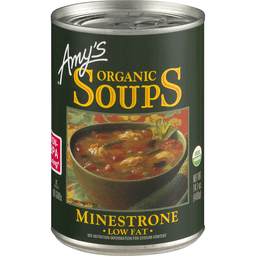 AMY'S ORGANIC LOW FAT MINESTRONE SOUP IS A COZY MEAL FOR THOSE LOOKING TO RECONNECT WITH NATURAL, SIMPLE INGREDIENTS. A HEARTY MEAL THAT WILL REMIND YOU OF MOM’S HOMEMADE SOUP, OUR 14.1 OZ. RECIPE IS CRAFTED WITH DICED TOMATOES, ONIONS, CARROTS, KIDNEY BEANS, POTATOES, CELERY, GREEN BEANS, PEAS, PASTA AND LEEKS. EACH CAN OF ALL-VEGAN SOUP CONTAINS ABSOLUTELY NO PRESERVATIVES WHILE BEING PACKED WITH 3 GRAMS OF DIETARY FIBER AND PROTEIN PER SERVING. OUR SOUP IS USDA-CERTIFIED ORGANIC, NON-GMO AND IS PACKAGED IN NON-BPA LINED CANS, SO YOU CAN BE SURE THAT WHAT YOU GET IS THE REAL DEAL. SEE NUTRITIONAL FACTS PANEL FOR ALLERGENS. AMY’S KITCHEN HAS GROWN BEYOND THE BERLINER FAMILY’S WILDEST DREAMS, GOING FROM SEVERAL FAMILY MEMBERS PITCHING IN ANYWHERE THEY CAN, TO A WONDERFUL GROUP OF EMPLOYEES, FARMERS AND SUPPLIERS. BUT NO MATTER HOW BIG THE COMPANY GROWS, ONE THING WILL ALWAYS REMAIN THE SAME—THE FAMILY SPIRIT THAT PERMEATES EVERY DECISION MADE INSIDE OF AMY’S KITCHEN.